Our committed team will swiftly turn your old, worn-out, non-functioning patio doorway into an eye-catching masterpiece that will breathe new life into your home. Choose from our 2-panel, 3-panel, and 4-panel patio door styles in sliding glass, French and hinged designs to create an entryway as wide or narrow as you need. And with a number of real wood interior options, you’ll be sure to find a look that complements your home perfectly. Regardless of which style you select, you can be sure you’re getting a superior door that will give you easy access to your patio and an expansive view of the outdoors while flooding the inside of your home with natural light. Yes, all of our patio doors look gorgeous and operate smoothly, but that’s just the beginning. The patio doors we install surpass industry standards for storm protection, forced entry, air and water infiltration, and energy efficiency, leaving your home secure from harsh weather conditions and unwanted intruders while also preventing air loss. Not only will you have the peace of mind that your home and family are safe and comfortable, but your home’s reduced energy output could potentially save you money on your electric bill, too. Our expert door installers proudly serve the cities and surrounding areas of Pittsburgh, Harrisburg, Lancaster, and Tampa. All of our patio doors are rigorously tested and certified by independent laboratories to meet the ENERGY STAR® standards established by the Environmental Protection Agency (EPA) and the U.S. Department of Energy. Your patio doors get a lot of use, especially when you invite guests over to enjoy the nice weather. 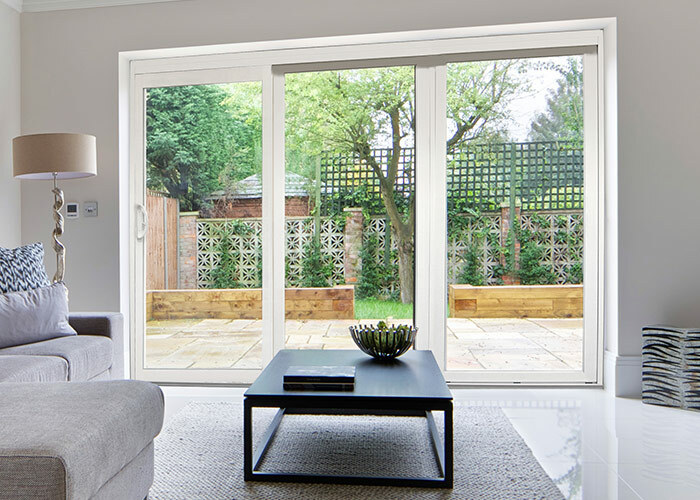 Everybody will love looking and walking through the luxurious, smooth-operating patio doors we install. Our patio doors will withstand the rigors of daily use while protecting your home from harsh weather and forced entry. Frames and sashes resist cracking, peeling, chipping, and blistering with very little maintenance on your part. No time to wait? No problem – Contact us today and we’ll get started on your door replacement project right away. We’ll have your new doors installed before you know it. Because drawn-out home improvement projects are a thing of the past. The quality of the doors are excellent. Had a great experience today with my new front door install. Craig Dunn and Tony Nanni did an awesome job and were very thorough assuring all the interior trim was saved and reinstalled which looks great! I was very pleased with my entire experience from the sale to the install. Ron Slaughter and Tony Nanni were very professional. Friendly with excellent workmanship. Very pleased with the installation of my new doors. I am a repeat customer. I had my bathroom done this past Spring, I just had my front door and screen door replaced this week. Jared and Tony did a great job. They were on time and were very professional. The doors look great. They were here on time and finished in the time I was told it would take. They cleaned up after they finished and explained all the features.